Decluttering Your Mind to Go from Self-Love to Self-Launch! It is a time of renewal and new energy. How are you taking this approach into your mind, body, and spirit? Let’s talk about it. We are never too old or too FABULOUS for a pep talk! Let’s talk about your powerful life passion, your juicy purpose,and your pleasure… It is time to declutter your life. Light a bold and bright mental candle. Take in the vanilla scent of the sandalwood incense blowing your way. Say it with me: I AM possible! I have been undergoing a MAJOR decluttering. I am tossing everything – and I do mean everything. Physical clutter, mental clutter, people clutter, and emotional clutter. This is not an easy thing for me because I have hoarding in my genes and I am a loyal (to a fault) Leo, if you know about such things. Those silver stilettos that are oh so pretty but they pinch my toes? Donated! That folder of ideas for that amazing script project that never happened. Tossed! I am also tossing old outdated beliefs that no longer serve me. Yes, of course I have them too. The need to hold on to things that no longer serve their purpose is poverty consciousness. We can see clutter when someone else is hoarding or holding onto sentimental things or that sweater we swear we’ll need one day, but it’s harder to see when it’s in our thoughts. Say it with me: I am enough! A few days ago I shared with you my devastating spiritpreneur story of getting fired, and how I created the Become the Guru approach from rescued fumes of that disaster. and creates more positive results. 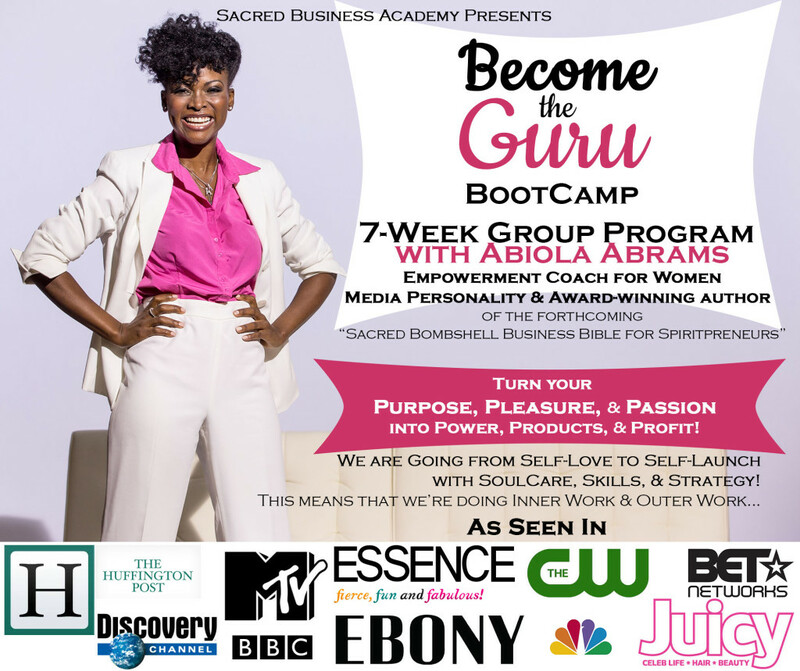 It’s less than 24 hours before we open the doors to allow my sacred bombshells the opportunity to enroll in my Become the Guru Bootcamp and I see more clearly than ever what works and what doesn’t. As a writer, I have tons of paper “stuff.” I still prefer paper journaling and handwritten mind maps and lists. I would never toss my journals and planners. But clothes, shoes, makeup, jewelry, old files, so many cameras, books, and just everything else? Say it with me: I am perfect in my imperfections. When you rid yourself of the things you no longer need, you make room for the blessings to flow. Your abundance, the beauty of life, the miracles, magic, and mojo that you came to manifest. When you let go of the stuff (junk, frenemies, dramas, things) you don’t need, you move from scared to sacred and activate your self-love to self-launch. Say it with me: I am worthy! So crank up the music, light a candle with the fumes of your passion, and make room in your life for pleasure. It is pleasurable to live your dreams. It is your birthright to step up to your purpose. It is your sacred duty to stop playing small. Your birth certificate is proof that we need the magic that you have! If you can read this, you are blessed. You have many things going for you. You have like-minded sisters, each with their own stuff, reading these same exact words at this exact same moment. In addition to using guided meditation and emotional freedom technique, the tool I have been using to declutter my mind with is Morning Pages. you’re familiar with Morning Pages already, this is a great time to start them again. Every morning for 20 minutes or 3 pages, whichever comes first, just write. Freewrite. If you don’t know what to write, write “I don’t know what to write.” This is just a brain dump. These notes are not meant to be read by anyone else — or even really you for that matter. Are you going to try doing Morning Pages for decluttering your mind — and to recover your pleasure, purpose, and passion? P.S. I’ve been doing this spring cleaning a bit at a time for the past couple of months. I have to tell you that I wake up lighter and more clear every day. So like I said, it’s 24 hours before I open the doors to invite new opportunities for you to enroll in my Become the Guru Bootcamp and I’m like a kid at Christmas. Catch up on the 3 free Spiritpreneur Success Strategy video lessons below so that you are more clear and focused on your purpose, your mission, and doing the work that you came to do. I created the free 4-part Spiritpreneur Success Strategy video e-course to celebrate the launch of my Become the Guru Bootcamp. Find 3 of the 4 lessons for signing in here.